I found this to be an easy sketch to work with. It's easily adaptable to may sizes and shapes of photos. Good thing. I used 4x6 photos. I'm working on making an album of my son's Bar Mitzvah. I've decided to take a simpler approach in creating the pages. I want the focus to be on the photos and the event, not the product and techniques. Most of the pages won't have a lot of journaling on them. I also want to get it done! Sketches are woking really well as part of this process. I can keep them simple of jazz them up. I chose to keep this one very simple. I didn't vary from the sketch very much, and didn't add a lot of extras. These photos are just before the service began. He was visibly nervous, but working through it himself. Once the service began, you wouldn't have known how he was feeling. Come on over to the Let's Get Sketchy blog. Get some inspiration from the rest of the deign team and join us in our newest sketch challenge. 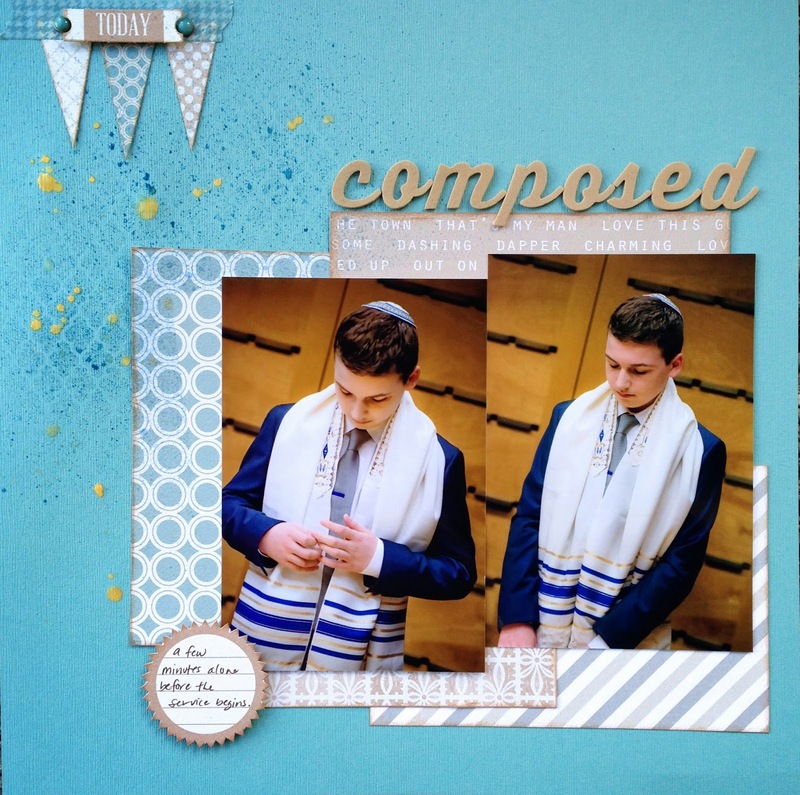 Devra, LOVE how you showcased these great Bar Mitzvah pictures. The colors really make them pop!!! Hope you will stop by and share your crafty creation! great page, love the colour combo! Beautiful page, Devra. Love all the blue tones. Love the mix of patterns and misting! Wonderful page!